This 25' Watson AC Power Extension Cord 16 AWG, in black, is a 3-prong, grounded, 16-gauge, UL-rated cable that supports devices up to 125V, 1625W in power. The maximum current draw is 13A. The frequency is 60Hz. The insulation and a water-resistant thermoplastic jacket allow for use indoors and outdoors. 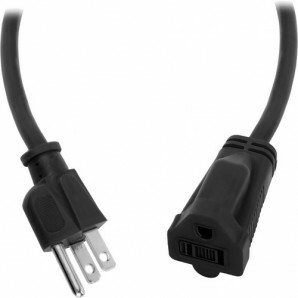 A safety cover integrated on the female plug protects the open end from liquid and dirt when the cable is not in use. Box Dimensions (LxWxH) 10.0 x 9.0 x 0.8"